There's just a hint of autumn in the air today which is enough to get me smiling as I do through the whole season. There's the rustle of dry leaves on the trees and some already on the floor, you can see plenty of late summer fruit around, it was dark at 6 o'clock this morning and it's a bit showery. I love it! And of course, I just can't resist a colour scheme that makes me think of autumn. This week, I'd like you to be inspired by this pinned colour scheme of teal, aqua, pale green, orange and coral with a hint of metallic. Originally pinned from Etsy shop Marolsha by Maddy here. This design is no longer available but her shop is full of simply gorgeous jewellery. 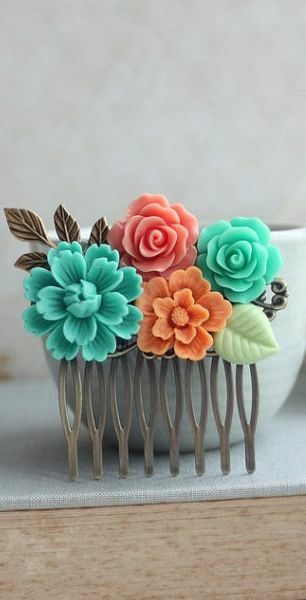 Of course, you might just be inspired by the hair jewellery itself but either way, we'd love you to be inspired by this prompt and hope you will share your creations - there are now two ways to do this! You can either upload your layout into the Whimsical Musings Flickr gallery with the tag WM#227 or you can post it in our Whimsical Musings Facebook group. We've decided that we'll save albums for special occasions so just load up your photo to the group with the tag WM#227 in the write up text so that we can find it. LOVE those colors and I think I have a little paper set that is perfect...off to dig it out!